Uber’s Carnegie Mellon partnership: How everyone wins in the end. 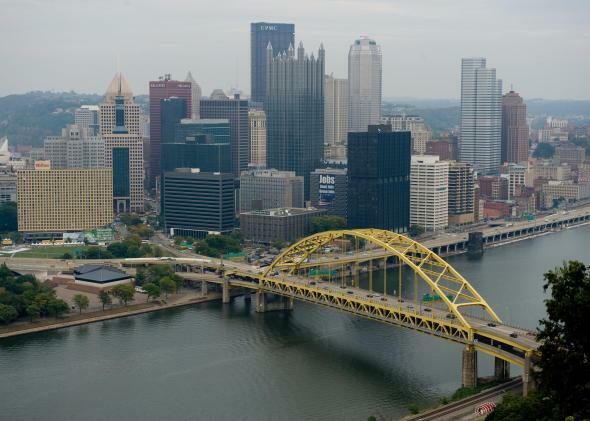 Thanks to Uber and Carnegie Mellon, Pittsburgh is becoming a hub for self-driving cars. Earlier this year, Carnegie Mellon University excitedly announced a “strategic partnership” with Uber, the Silicon Valley ride-hailing startup. The deal was to kick-start Uber’s efforts to build driverless taxis, while the company funded faculty chairs and graduate fellowships at Carnegie Mellon’s National Robotics Engineering Center, one of the nation’s top robotics labs. Less than four months later, it’s looking more like win-lose. Using its venture capital windfall to offer six-figure signing bonuses and mammoth raises, Uber has reportedly hired away 40 of Carnegie Mellon’s researchers and scientists, including the robotics lab’s director and most of its leaders. The Wall Street Journal called it a “raid” that “left one of the world’s top robotics research institutions in a crisis.” The lab had expected to bring in $30 million this year in contracts with the Department of Defense and others, the WSJ reported. That’s down to $17 million thanks to the departure of the researchers who were handling many of those contracts. And that’s before the partnership has even really begun. Uber and the university have yet to work together on any projects. They haven’t even reached an agreement on the funding for faculty and students. At first blush, it would appear that Carnegie Mellon got played. That should not come as a surprise: In its five years of existence, Uber has shown zero scruples in its business practices. Under the leadership of founder and CEO Travis Kalanick, an Ayn Rand acolyte, the company has been accused of sabotaging rivals, dodging disability laws, plotting to blackmail female reporters, and pushing its own drivers into shady subprime auto loans, to name just a few of its questionable tactics. Why wouldn’t it seize an opportunity to pillage a publicly funded academic institution for its own gain? But wait: Before we chalk this up as yet another case of Uber being evil and tech startups using their piles of venture capital to trample on the little guy, it’s worth taking a closer look at who’s actually been harmed here. It isn’t the poached researchers, who find themselves flush with cash and resources. It certainly isn’t the city of Pittsburgh, whose burgeoning tech sector suddenly is stealing headlines (and jobs) from Silicon Valley as Uber sets up shop there. And, in the long run, this should even be good for NREC itself. Yes, Carnegie Mellon’s robotics lab will have to regroup and rebuild, and its remaining researchers are no doubt feeling betrayed. They’re also probably fuming with jealousy at their former colleagues’ big paydays. Picking up the pieces will be a challenge in the short term. But as key players have pointed out, the great Uber raid of 2015 may leave NREC’s long-term prospects brighter than ever. “We are really proud that Uber has decided to come here rather than those guys in Boston,” the dean of Carnegie Mellon’s computer science department told the WSJ, referring to rival MIT. He’s right: NREC just burnished its reputation as a pipeline to high-paying industry jobs. Becoming known as a pipeline to industry jobs might not sound like the highest and best goal for an academic research institution. That said, it has arguably worked out pretty well for large swaths of Stanford, whose engineering departments double as Silicon Valley’s top farm team. Besides, the National Robotics Engineering Center was not exactly a paragon of pure academic inquiry to begin with. Unlike, say, Carnegie Mellon’s physics department, NREC is self-funded, which means it is beholden to the interests of the outside entities with which it contracts. The largest of these by far is the U.S. Department of Defense, for which the lab has become known for building military robots like the Crusher, a 13,000-pound unmanned tank. The lab has also, of course, produced more peaceful robots, like a fleet of autonomous trucks that Caterpillar uses for mining operations. And long before it agreed to help Uber build self-driving cars, it was doing the same for General Motors. This is not to criticize Carnegie Mellon or NREC, which deserve credit for developing some remarkable technologies, many with beneficial applications. But they’ve generally been developed with either commercial or government ends in mind, which set them apart from classical scholarship. One of the great roles of academia in a capitalist society is to underwrite research that would not otherwise be funded by private interests. That may have once been true of research on autonomous vehicles. But if it was, it certainly is no longer. Self-driving cars are rapidly moving from the realm of far-out science to commercialization. Any time that happens to a given field of inquiry, it’s inevitable that the most desirable jobs migrate from academia to the private sector, whose hiring is driven by the profit motive. This happened to the field of computer science decades ago. That’s why Mark Zuckerberg didn’t grow up dreaming of a tenured professorship. At the same time, society at large has less need for academic institutions to pursue such a field, unless they’re doing so in a way that private interests can’t or won’t. That was evidently not the case for many of NREC’s researchers, many of whom had one foot in the private sector already. But perhaps it could be in the future. Many academic computer science departments today devote themselves to problems that for-profit tech companies have little incentive to solve. If NREC wanted to insulate its next generation of scientists from market pressures, it could scale back its work on autonomous cars and refocus around fresh areas of research whose commercial applications are less obvious to well-funded Silicon Valley startups. It could stop building navigation systems for self-driving cars and ramp up its research on, say, how robots can be taught to make ethical decisions. Somehow I doubt that Uber will have much interest in that.